This table was inspired by an antique found in Paris. It can easily seat 10 to 12 and the base is planned to best seat the number of chairs needed. The Rouen is made of solid maple, distressed and colored to a rich golden hue. Custom woods and finishes are available as needed. 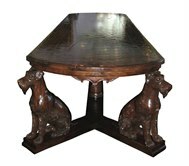 A Rouen Table top is also available for $2,200.00.